Read about the top 10 reasons to still be pissed off about the BP spill here. For Gulf coast residents, though, the nightmare was just beginning. A year later, business hasn’t come back for many in fishing and tourism, and the compensation check from BP still hasn’t arrived. In the areas closest to the shores, people are reporting health problems consistent with exposure to chemicals. Dead turtles, dolphins and fish are still washing ashore. So are tar balls. So while most of the country has moved on, a number of Gulf coast residents have been in DC over the past week to tell decisionmakers one thing: It’s not over. Mother Jones talked to with several Gulf residents who have become advocates for their communities in the wake of the spill. Arnesen and her husband, David, were just putting the finishing touches on the house they rebuilt after Hurricane Katrina when the Deepwater Horizon exploded. The disaster made an accidental activist out of this fisherman’s wife and restaurant owner. To read my interview with Arnesen, click here. Foytlin, a reporter, wife of an oilfield worker, and mother of six, walked 1,243 miles from New Orleans to Washington, DC, to demand a better future for Gulf residents. To read my interview with Foytlin, click here. 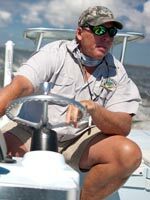 Lambert rebuilt his charter boat company, Cajun Fishing Adventures, after it was destroyed by Hurricane Katrina. But a year after the oil disaster began, business still hasn’t come back. To read my interview with Lambert, click here.